Organizations want to achieve maximum security and performance level of their cloud infrastructure. Certain practices should be followed by users to achieve maximum throughout levels and efficiency in their cloud environment. Redshift is the data warehouse and analytics service provided by AWS. 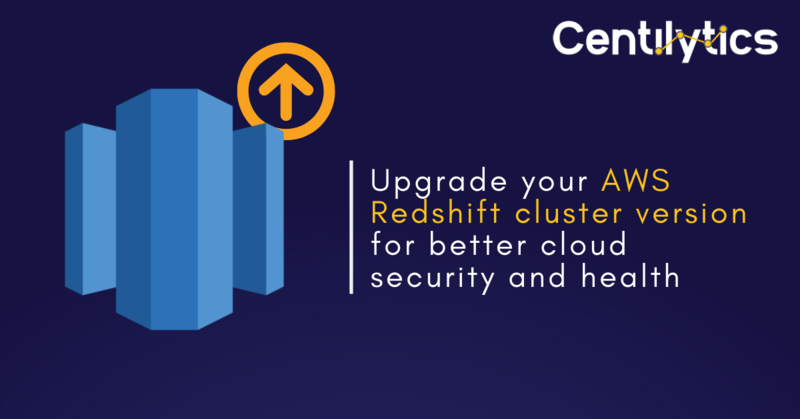 It is highly recommended to give attention to AWS Redshift cluster version upgrades to achieve maximum output levels of your data warehouse in the cloud. Why AWS Redshift cluster version upgrade is important for cloud security and performance? As discussed in our previous article, the first step to use AWS Redshift is to launch a set of nodes, called Redshift cluster. Each cluster runs a Redshift engine and can contain one or multiple databases. Redshift uses columnar storage technology and parallelizes and distributes queries across multiple nodes. Each cluster in Redshift contains multiple nodes. Each cluster consists of a leader node and one or more compute nodes. The main task of the leader node is to receive a query from client applications, parse the query and develop its execution plans. Leader node also coordinates parallel execution of these plans with compute nodes and receives the results from compute nodes and returns the result of the query back to the client application. AWS provides a setting called version upgrade which, if enabled, automatically upgrades the Redshift engine if a new engine version is available. Redshift engine upgrades are also referred to as ‘major version upgrades’. This setting is by default enabled in AWS when a new cluster is created by the user. It is recommended to keep this setting enabled as it leads to better performance of Redshift cluster. Data warehouse engine gets some new features released in the new version. It also leads to optimized performance through some bug fixes in the previous AWS console and latest security patches which are available in the new version upgrade. Centilytics shows all your Redshift clusters existing in your AWS account and also shows the corresponding status whether cluster upgrade option is enabled or not. OK This indication will be displayed when ‘allow version upgrade’ option is enabled on the corresponding Redshift cluster in AWS. CRITICAL This indication will be displayed when ‘allow version upgrade’ option is disabled on the corresponding Redshift cluster AWS. Region: This column shows the region in which the corresponding Redshift cluster exists. Allow Version Upgrade: This column shows the status of the corresponding Redshift cluster specifying whether cluster upgrade is enabled or not. If version upgrade is enabled, then true will be displayed. Otherwise false will be displayed. Identifier: This column shows the name of the corresponding Redshift cluster. Resource Tags Applying resource tags filter will display those resources which have been assigned the selected resource tag. For e.g.- If the user has tagged some resource by a tag named environment, then selecting environment from the resource tags filter will display all the data accordingly. Resource Tags Value Applying resource tags value filter will display data which will have the selected resource tag value. For e.g.- If the user has tagged some resource by a tag named environment and has given it a value say production (environment: production), the user will be able to view data of all the resources which are tagged as environment: production. The user can use the tag value filter only when a tag name has been provided.